Spark is born last May 1 2007, his mother is yoohdelehoohoo my sister's jack. Spark is a nice dog and intelligent, if I said finished your food if you don't I will not send you out of your cage, so he rush to finished his food, and when he saw chicken, cat, bird, rat, insect, strangers and even other dogs he keeps on barking and barking, and if I said stop he will stop barking. He will not pipi or popo in his cage unless i bring him outside his cage, and he likes to take a bath, he plays with the water from the hose, he eats every thing you gave to him. Thats all I can say to spark the spark. 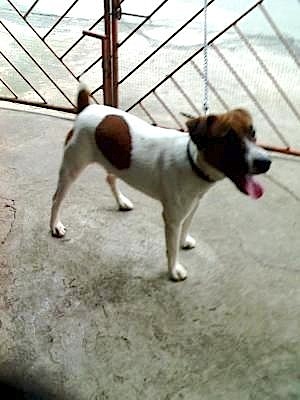 Spark is a male Jack Russell Terrier.